Thursday, March 3, 2011: Underway at 0915 following a great visit with Charlie and Terri in Prescott, Arizona. We decided to take AZ-89 up into the Prescott National Forest, which features the largest stand of ponderosa Pine in the country. There was very little traffic and the roads, although steep and winding, are very well maintained. Topping out at 6,100 feet elevation we pulled over for a snack and to walk around a bit. The temperature was a pleasant 43 degrees, and the air was clear and sweet with the fragrance of pine…..what a great morning to be in the woods. 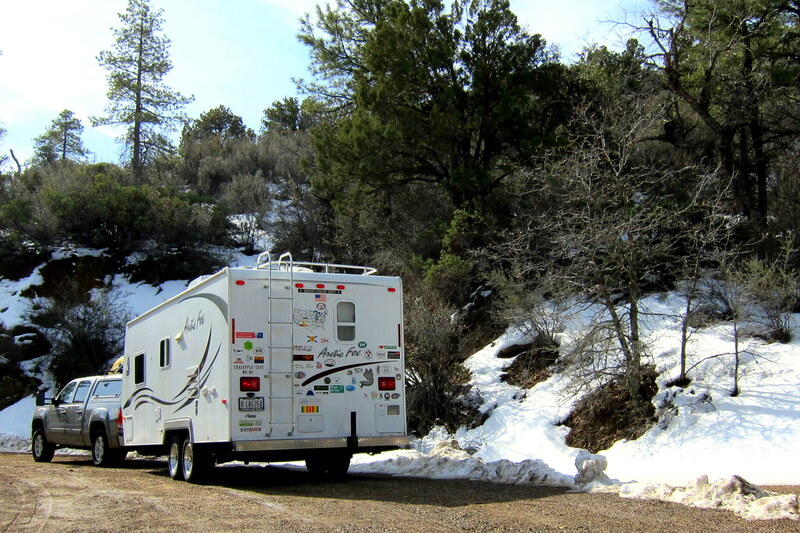 At 6,100 feet in elevation one would expect a little snow……even in Arizona. After all this is almost 1,000 feet higher than Mount Katahdin back home. Believe it or not, we kind of enjoyed being in the snow again. It has been less than one hour since we started our climb up into the mountains and we are back in the desert. As we neared Congress, Arizona, and pondered the town’s name. It occurred to me that this place may be unique as, true to its namesake, it must be populated by village idiots and political nutcases that work very hard at mismanaging their economy while advancing their pathetic political careers. Um…..sorry, every time I see the word congress, I get like this. Moving over to AZ-71 we soon entered the little town of Aquila where we hooked up with our old friend US-60. Soon we were on I-10 heading west toward Quartzite. Well this is where it got a bit interesting. There was one fuel station open between Prescott and I-10, and that was in a little one pump town where the price was ridiculous. My “Miles to Go before Empty” computer thingie showed we had enough gas to get to I-10 where there would surely be many fuel opportunities. Nope, just barren desert. Lucy showed the closest fuel was in Quartzite 15 miles away. I had enough fuel to go another 10 miles. Got a bit tense until I remembered we had two gallons of gas in our generator gas can…..problem solved. In Quartzite, according to the computer thingie, I took on 27 gallons of gas in my 26 gallon tank. Oh, I also filled up the generators tank as well. From Quartzite, we took US-95 heading south toward Yuma, Arizona where we pulled into the US Army proving Ground’s RV Park for the evening. Friday, March 4, 2011: Enjoyed a lazy morning as we took our sweet time getting on the road. Departing Yuma around noon the skies were sunny and the temperature was 74 degrees. Noticed on Lucy that the current elevation is 140 feet above sea level…..a big environmental change since yesterday. We decided to meander a bit and took dozens of farm roads as we traveled through the agricultural area of Imperial Valley. 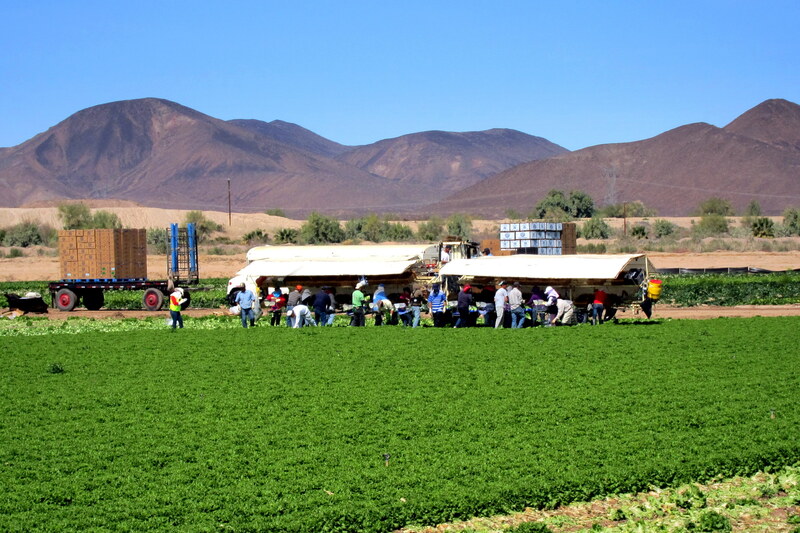 There were miles and miles of crops being tended by hundreds of workers. Nearing Bard, Arizona we noticed a sign that said “Imperial Date Farm–2 miles” and figured it was some sort of dude ranch for singles. 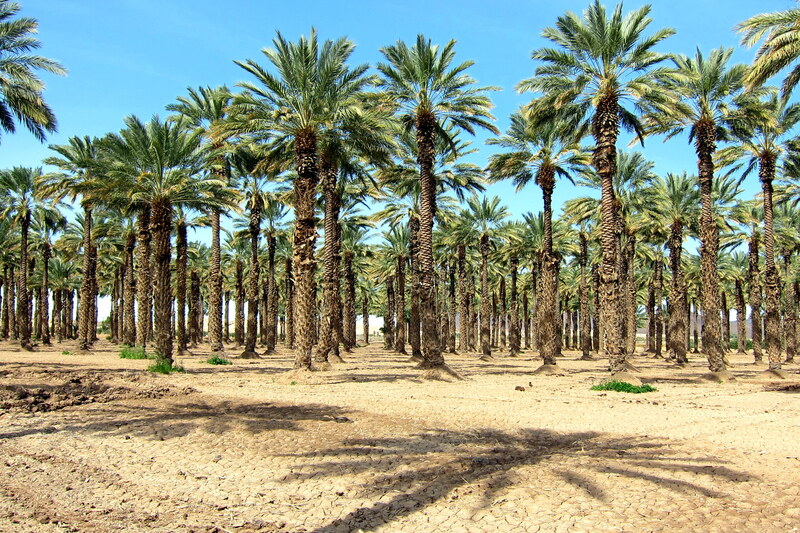 However it turned out to be an actual date farm surrounded by fields of Date Palm Tree’s. In two miles we came to The Imperial Date Gardens Restaurant and Gift Shop. Looked as good a place to stop for a break so stop we did. The store was filled with all things date related and we picked up a bag of fresh dates as well as a couple of date shakes…..all of which was delicious! As we neared I-8 we noticed a sign for The Cloud Museum…..didn’t stop, but should have. I haven’t a clue what a cloud museum would be like. Once on I-8 we continued our westward travels and soon crossed the California border. A quick stop in El Centro for some Wal*Mart shopping and walking around time and we were off rolling once again. As we neared the Laguna Mountains east of San Diego, we passed a sign that said we were at sea level…..the temperature is currently 81 degrees. Forty five minutes later we are at 4,181 feet and the temperature had dropped to 66 degrees. 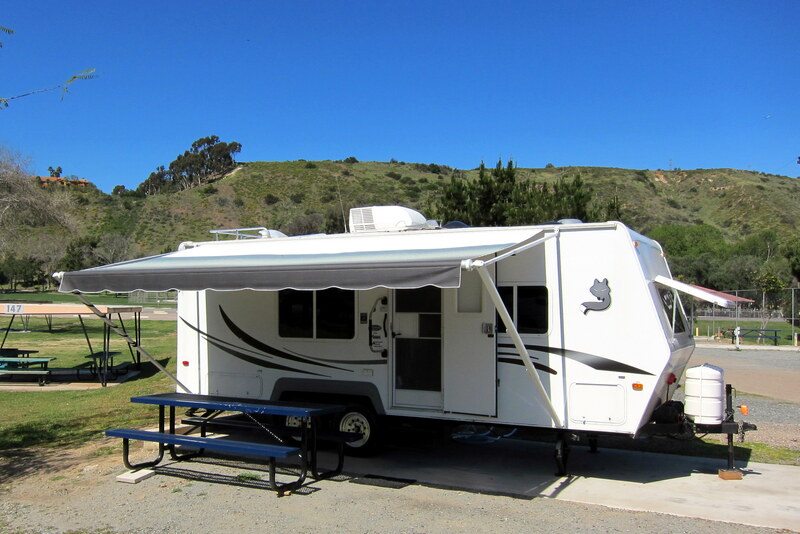 At 1730 we rolled into Admiral Baker RV Park in Mission Valley for a one week stay. Saturday, March 5, 2011 through Thursday, March 10, 2011—San Diego: We had a great time in our old home town of San Diego camping in a very nice full hook-up site at the Admiral Baker Navy Recreation Field. Admiral Baker is a stone’s throw from where Kit and I grew up and provided a convenient and comfortable setting for our time in this great city with the fabulous weather. 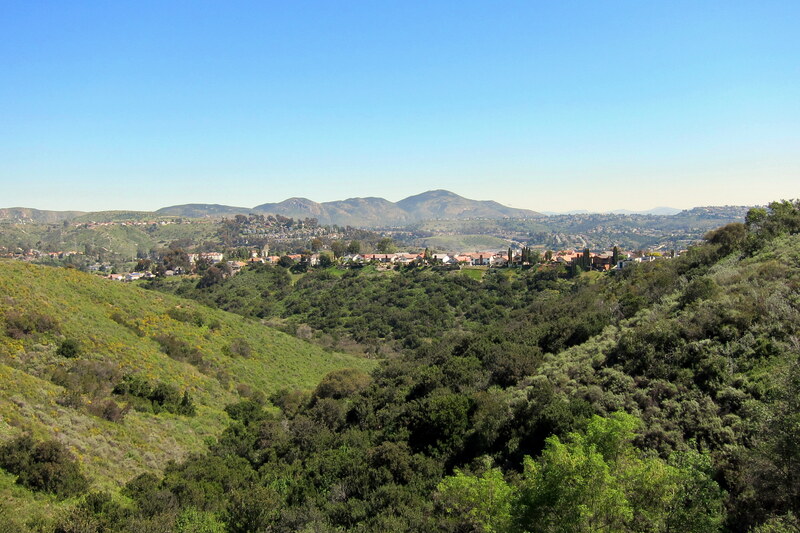 Here is a photo taken from the mesa where we grew up looking into the valley where we are currently camped. 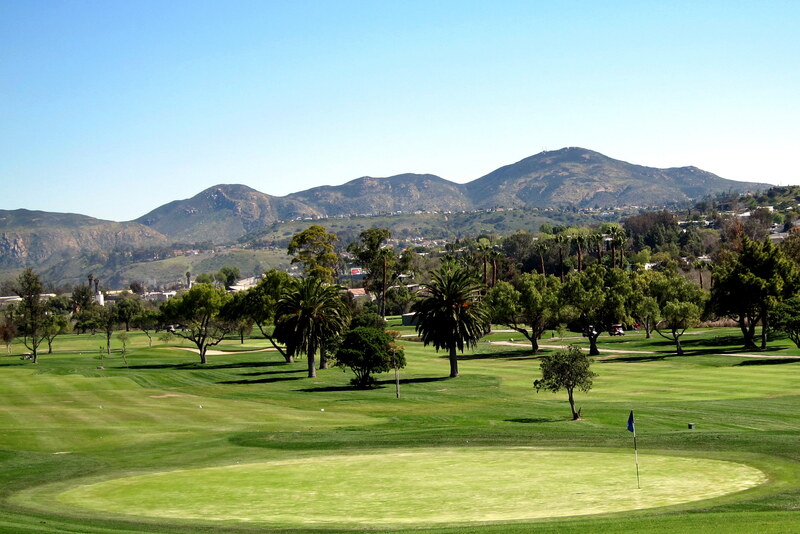 The park has a world class golf course. And a very nice pool. 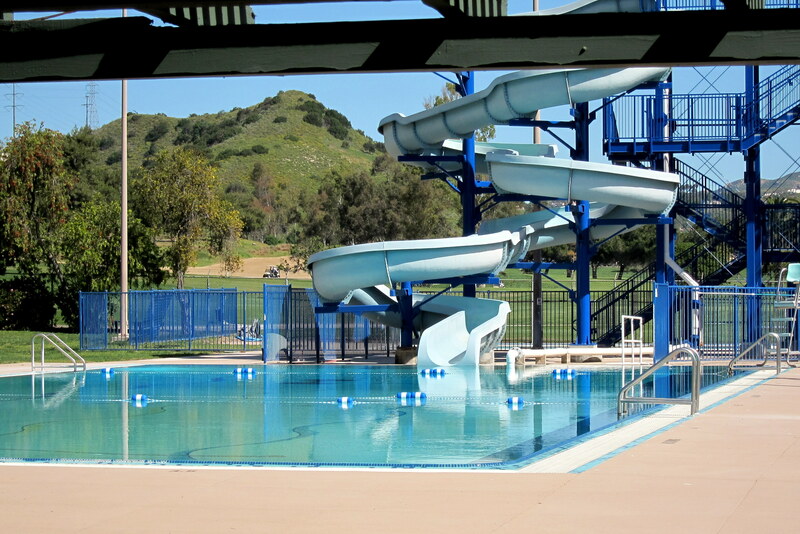 As well as recreation fields for all ages. 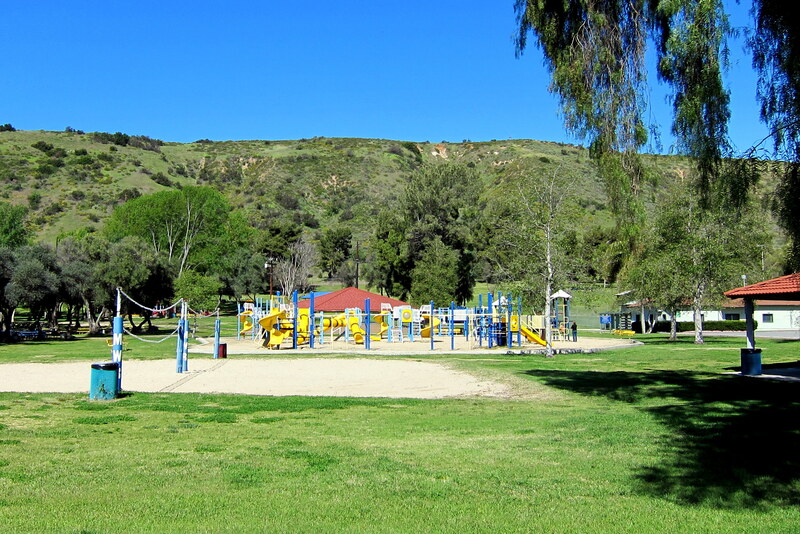 Admiral Baker Field has all the amenities of any full service campground. 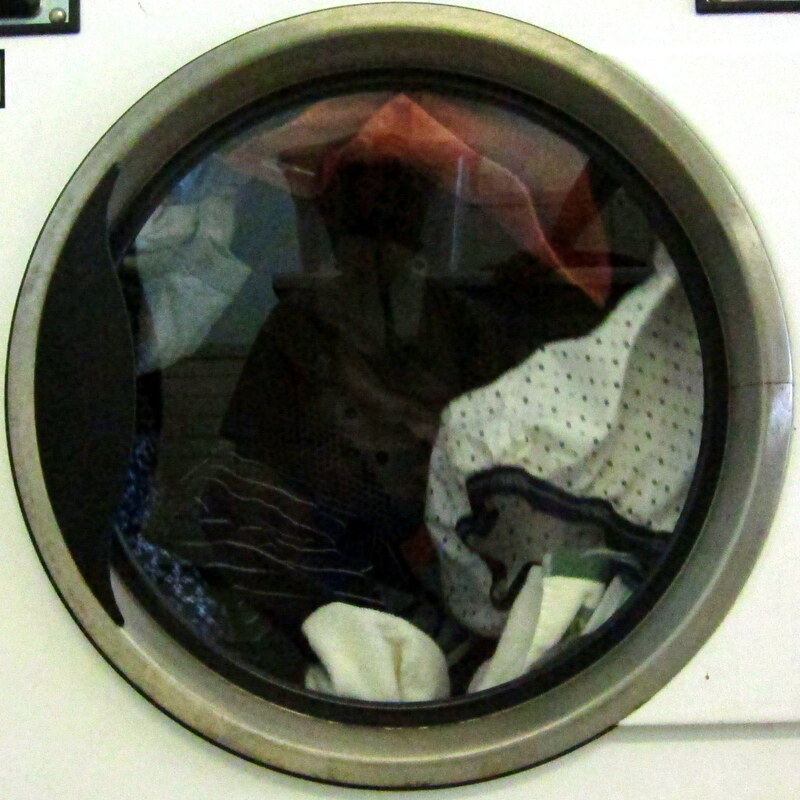 However during our stay the laundry room was out of commission so off we went to a Laundromat in town. Now readers may recall that, after the Great Nova Scotia Flood of 2010, I am serving a lifetime restriction from having anything to do with the laundry. So after walking a few laps of the parking lot I dared enter Kit’s domain and was surprised to find a television. Being midday it looked to be a soap opera and was actually pretty boring. However it did keep me occupied for a few hours and out of Kit’s hair. Somehow, our little website caught the attention of San Diego based JDF Publishing. So while in town we were visited by the founder and CEO, Mr. Juan Diego. Below is a photo of Juan and I discussing a potential book deal. OK…..that’s actually my brother in law, John. However he does have a few self-published books in the market as well as a number of online T-shirt shops. He did encourage me to consider compiling some of these journals into a travel book of sorts…..we’ll see. Kit and I had a great time visiting with her brother and remembering childhood adventures. John is one of the few family members that continue to reside in San Diego. You will notice that John is modeling one of his very creative T-shirt designs in the photo below. As I’ve often said, San Diego is a great city with the best weather anywhere. However it is a large city with all the associated problems of any large city. Even though the traffic here isn’t as bad as the traffic in Los Angeles…..it is still pretty bad. As we went out exploring one day we came across this interesting scene. Apparently some commuter decided to do some off-roading and ran over a fire hydrant. 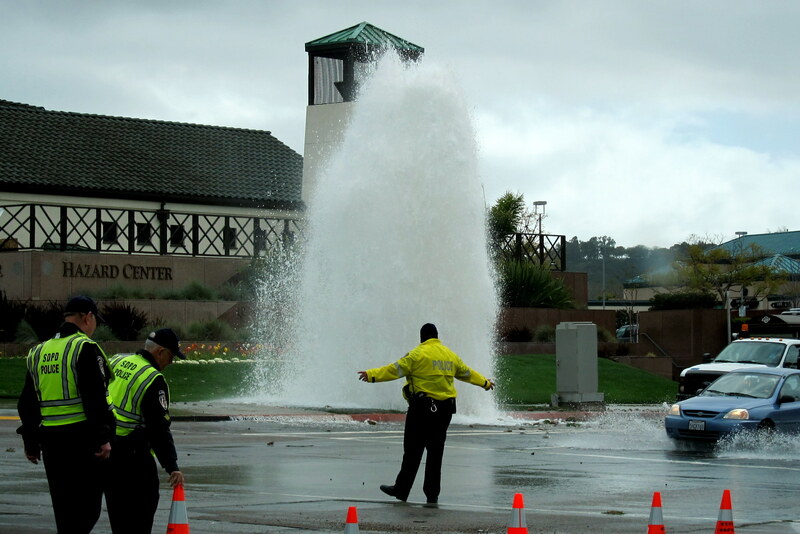 The resulting fountain was a rather attractive addition to this particular corner of Mission Valley. As an amusing side note notice the sign on the wall. 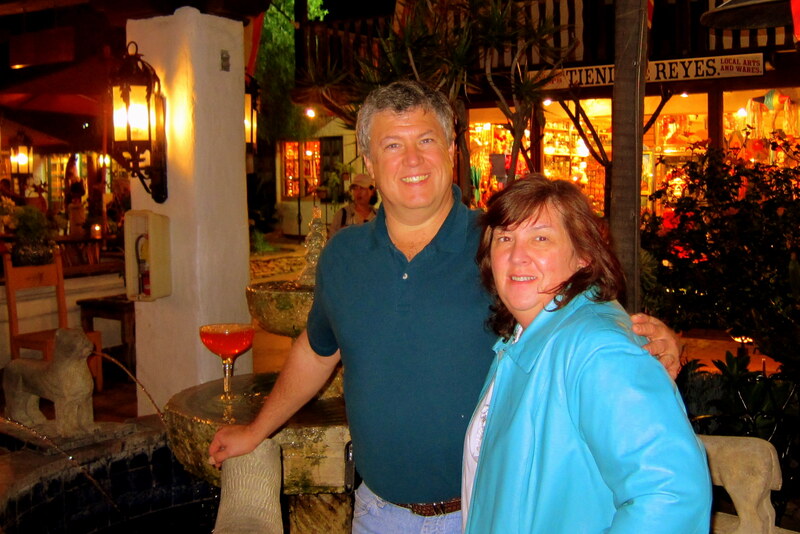 One evening, Kit and I met up with some friends for dinner at a very nice Mexican restaurant in Old Town San Diego. Scott and Marie have been living in San Diego for just over a year. I used to work with Scott up in Maine before the company transferred him to San Diego. We had a very nice time mingling with the Saturday night crowd while enjoying great food and drink with a fantastic couple. 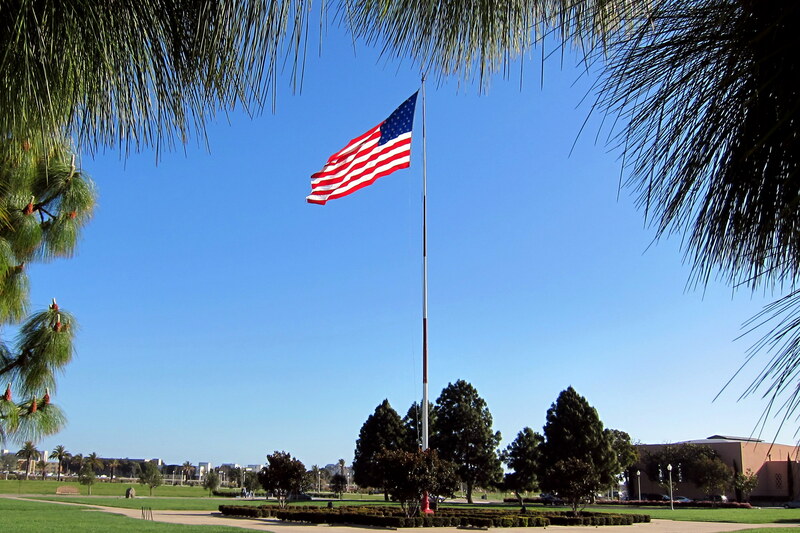 On another day, we decided to check out the old Naval Training Center off of Rosecrans Boulevard. The base had been an active Navy training facility for over 70 years. At the height of World War II 33,000 young recruits were being trained there…..at the same time! This prime bit of San Diego real estate was given over to the city when the Navy closed the center. Since I went to boot camp here back in 1965 I had a keen interest in seeing how much it had changed. I was surprised that I recognized many of the buildings and that the city had done a great job in preserving this bit of San Diego history now called Liberty Station. Even the old training ship, USS Recruit was still in great shape. 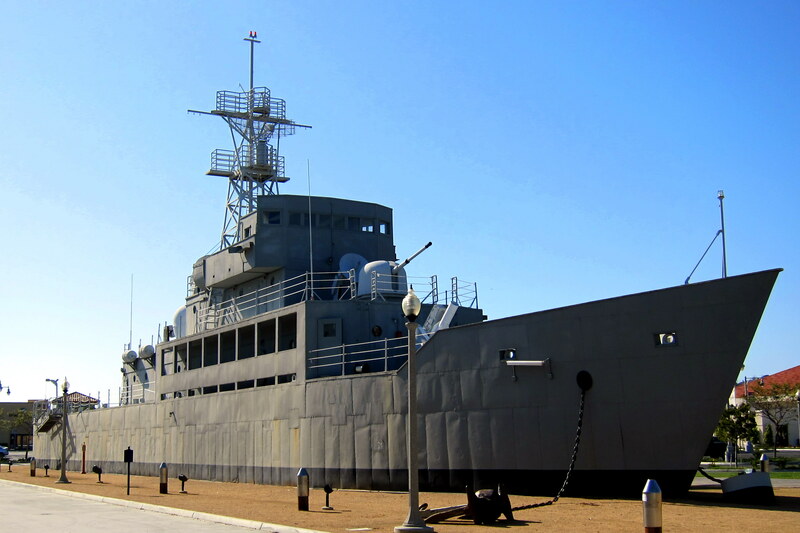 Built and commissioned in 1949, the landlocked ship had been in continuous service for close to 50 years. She was affectionately called “USS Neversail” by the thousands of recruits that trained on her. 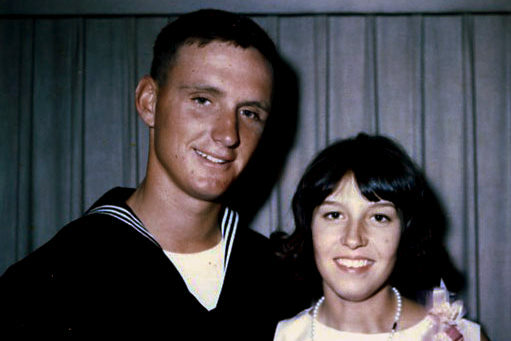 Including this dorky looking sailor shown with his young bride. That folks, is our wedding picture taken on some day in June I think, of 1965…..which was just days before I obtained my driver’s license and we headed out for our first duty station of Key West Florida. Yea…..I do remember it was June 4th as it was the day I became as happy as all my other married friends. One of the guys that came to my graduation from boot camp was my best (male) friend Rodney. 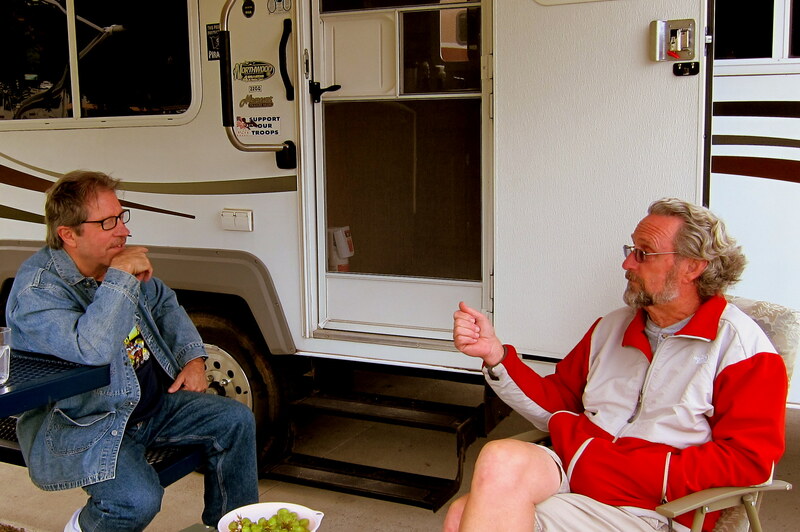 Kit and I reunited with Rodney a few years ago and look forward to visiting with him and his wife Gloria whenever we get to town. 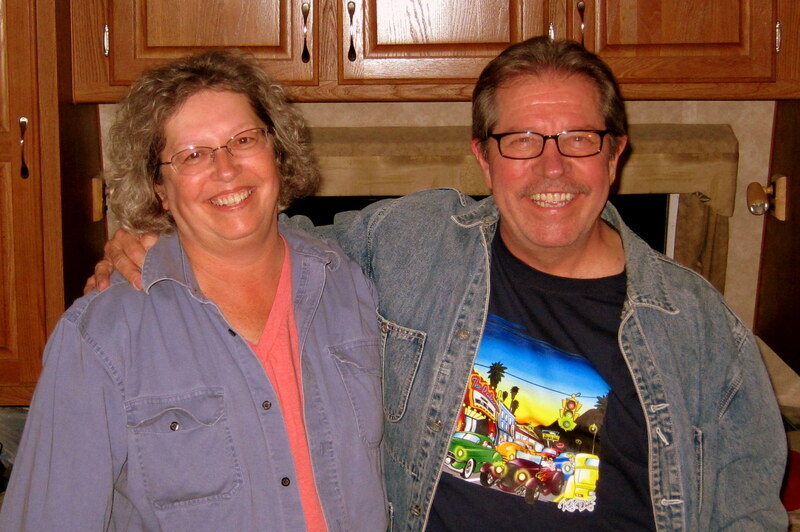 Rodney is Marta’s brother who you met in our last journal when we visited Sun City, Arizona. 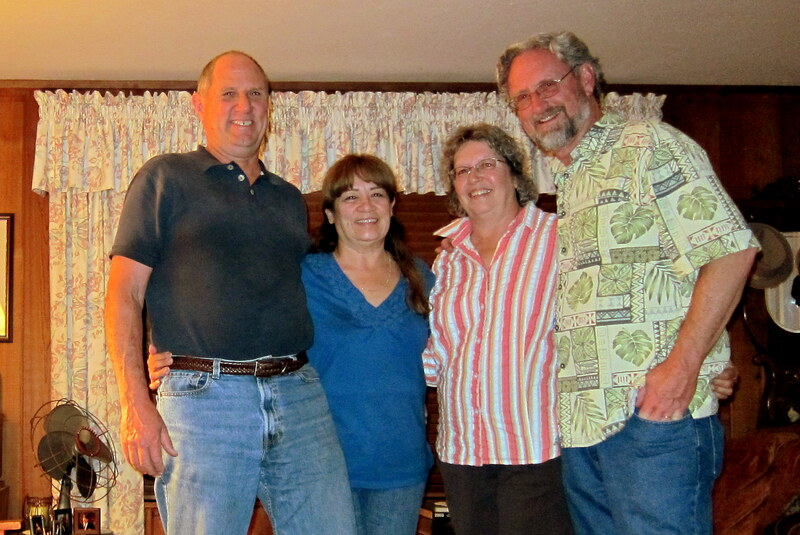 Rodney and Gloria graciously invited us to visit them at their home in the eastern San Diego town of El Cajon. Gloria made us a fine meal and we enjoyed getting caught up on each other’s lives. While enjoying their company we were delighted when they announced that they are planning a trip east and may take us up on our offer to host them in Maine this summer. We really hope their plans work out! After a great few days in our old hometown it was time to motor on. Tomorrow will mark the two month point of this year’s Excellent Adventure. We have traveled 5,643 miles and are currently at our planned westernmost point…..any further west and we would get mighty wet! So come dawn we are officially on our way home…..however the return trip is likely to take about three months. We now have passports and central Canada beckons. 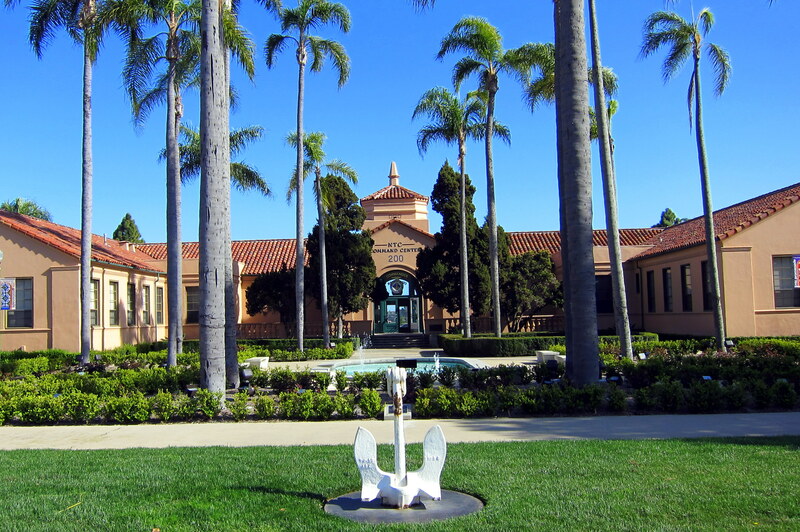 I was concerned with the Naval Training Center, and what they would do to it. I was amazed, and thrilled, that they kept alot of the buildings and the USS Neversail. Preserving the San Diego of yesteryear is as important as progress. They did an okay job. Next year, I will be a permanent fixture in SD…once I finish up this year of travel. We will plan that get together then! Send me John’s website for tees…and, what books has he published?? Loved the wedding photo—weren’t you the cute couple! Bill, Here is a question for you to ponder a bit. Based on the reading of each of your interesting blog entries, how do you keep track of what you have done each day along with the route numbers, elevations, etc. ? Does Kathy keep notes, or do you record each event, or maybe just make it up as you go along? Actually….all three. It is up to the reader to sort it all out. I’m too busy taking care of the serious business of retirement. In reality, Kit does a great job tracking details in a small notebook as we motor about. Since it takes me weeks to get around to putting it all in bits and bytes I rely heavily on her note taking. We look forward to seeing you folks in Maine this summer! I think your brother in law is right….you should consider a book. You did an excellent job and I love your photographs…. 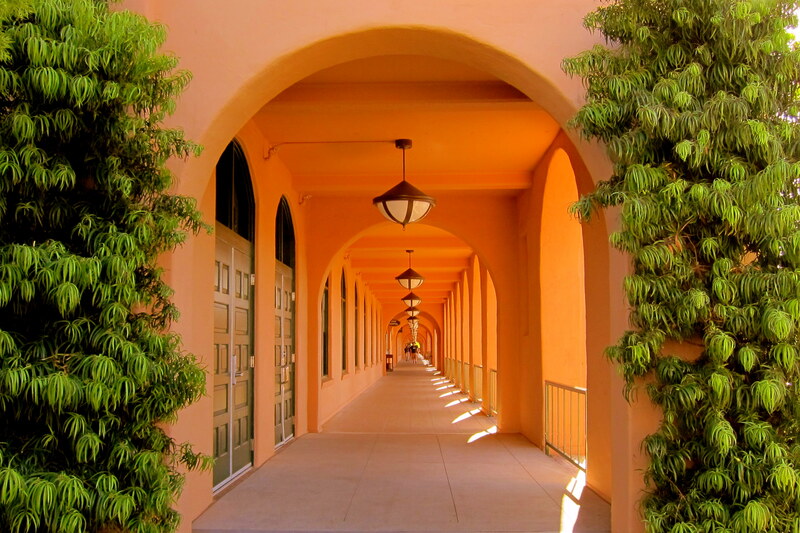 especially the one of the long, peachy-colored corridor…..Have a safe trip to Canada, eh? Hey…..thanks. This whole thing started as a way to keep family and a few friends abreast of where we may be and what we may be up to. originally about 12 e-mails…..it is now up to over a 150!!!! Kinda humbling and a bit overwhelming.